www.cheersonline.com 45 March 2015 • rarely add anything real to the drink." A staple in molecular gastronomy— and mixology—foams are meant to add texture, aroma and a hint of fl avor. When done right, they can be striking additions to cocktails. Chef José Andrés' concepts have long used airs in dishes and sips; at The Bazaar by José Andrés, a 417- seat modern Spanish molecular gastronomy restaurant in Los Angeles, the Truffl e Noir ($17) mixes mezcal, Drambuie, blueberries and lime, garnished with truffl e salt air. The "New Way" Dirty Martini ($17) tops the classic drink with a spherifi ed olive and olive brine air. Less is more when it comes to most foams, says The Bazaar bar manager Vahan Petrossian. "Garnish conservatively to enjoy the essence of the air." Modern foams typically use soy lecithin and need to be made à la minute, which can be tricky for busy bars. "An iSi whipper works great with some egg whites, a sugar (liqueur), acid (citrus) and a double charge," explains James. A challenge with foam fi nishes is when—and how—to actually sip the drink through the whipped layer on top. Cure has solved that dilemma by "gluing" a dehydrated piece of citrus to the rim of a glass with a highly concentrated complementing fl avored syrup, and then dropping the foam on top. Cure's Rum ($10) mixes rum with Lillet Blanc that's infused with oranges and cinchona bark, preserved-rhubarb liqueur, and sumac bitters; a dehydrated orange wheel set on the rim of the glass is topped with a rich Campari syrup and a mountain of sumac foam. "The guests can, at their convenience, pick up and crunch into citrus, foam (holding the acid component usually) and sugar," Anderson says. "It is a well-rounded garnish." RIM SHOTS Another garnish technique that can pose a sipping conundrum is the glass rimmer. Many bartenders will run a citrus wedge around the rim of a cocktail glass and then dip the rim into a sugary or salty mixture. But a full rim is often too much. You should just rim half the glass, or at least leave a portion unrimmed, Anderson says. "This allows the guest to opt out of having every sip be sugary sweet" or overly salty or spicy. And look beyond the expected plain sugar and salt by adding spice, like a touch of cinnamon to the rim for an Apple Martini, Ellman says. "Think about ways you can bring out a fl avor that might be subtle or nonexistent without it." Use a light hand with fl avorings, though, says Ismail. "Don't overpower a drink with heavy salts and spices on the rim," he cautions. "Balance isn't just for the drink; it's for the garnish as well." Not every funky garnish fl avor is going to be a fi t. Ellman prefers a simple lemon peel or plain olives in a Martini, rather than overtly fl avored varieties such as those stuffed with blue cheese, which can overpower the delicate gin or vodka and vermouth. Michael Pickering agrees. 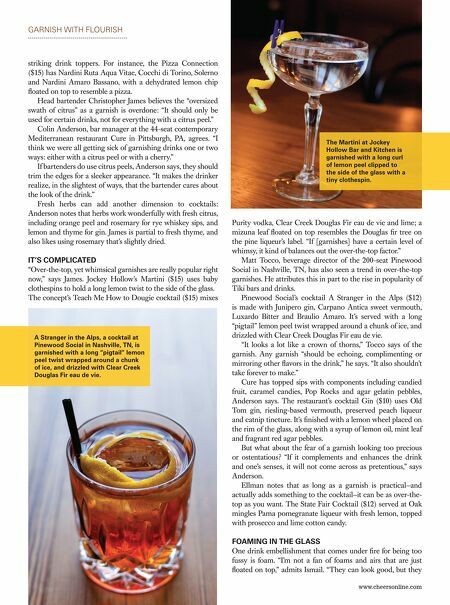 "I wish blue-cheese olives would go by the wayside," says the beverage manager for the 192-seat restaurant Travelle in Chicago. "Especially if it's a gin Martini, the funk muddles all of the botanical notes." Pickering's A Martini ($22) drops olives stuffed with caviar into the Boyd & Blair vodka-based sip, and spritzes it with a truffl e mist. The vodka's neutrality doesn't compete with the other ingredients' distinctive aromas and fl avors, he says. No matter the ingredients, each garnish should ultimately serve a purpose, and not just exist for its own sake, according to Petrossian. "A garnish is more than a dangled ornament on your glass," he says. "It is an opportunity to highlight an extra dimension to your cocktail through aromas and/or fl avors." Kelly Magyarics, DWS, is a wine, spirits and lifestyle writer and wine educator in the Washington, D.C. area. She can be reached through her website, www.kellymagyarics.com, or on Twitter or Instagram @kmagyarics. 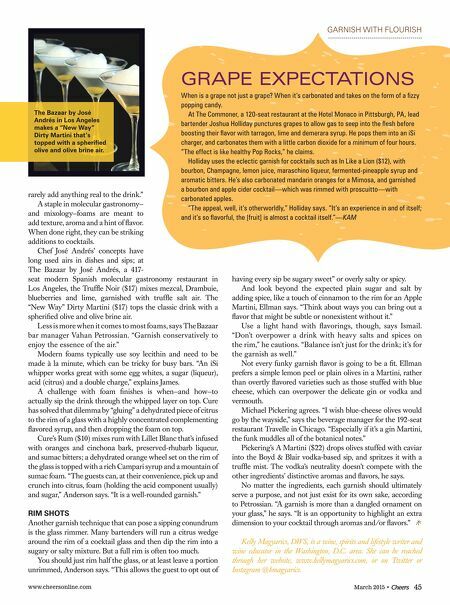 GARNISH WITH FLOURISH GRAPE EXPECTATIONS When is a grape not just a grape? When it's carbonated and takes on the form of a fi zzy popping candy. At The Commoner, a 120-seat restaurant at the Hotel Monaco in Pittsburgh, PA, lead bartender Joshua Holliday punctures grapes to allow gas to seep into the fl esh before boosting their fl avor with tarragon, lime and demerara syrup. He pops them into an iSi charger, and carbonates them with a little carbon dioxide for a minimum of four hours. "The effect is like healthy Pop Rocks," he claims. Holliday uses the eclectic garnish for cocktails such as In Like a Lion ($12), with bourbon, Champagne, lemon juice, maraschino liqueur, fermented-pineapple syrup and aromatic bitters. He's also carbonated mandarin oranges for a Mimosa, and garnished a bourbon and apple cider cocktail—which was rimmed with proscuitto—with carbonated apples. "The appeal, well, it's otherworldly," Holliday says. "It's an experience in and of itself; and it's so fl avorful, the [fruit] is almost a cocktail itself. "—KAM The Bazaar by José Andrés in Los Angeles makes a "New Way" Dirty Martini that's topped with a spherifi ed olive and olive brine air.